- Mollie Brown on 六月 29, 2016. Building a fashion brand is tough – Especially for Canadian designers. What does it really take to launch a fashion brand? Talent, yes. Connections, most definitely. But more than anything: money. 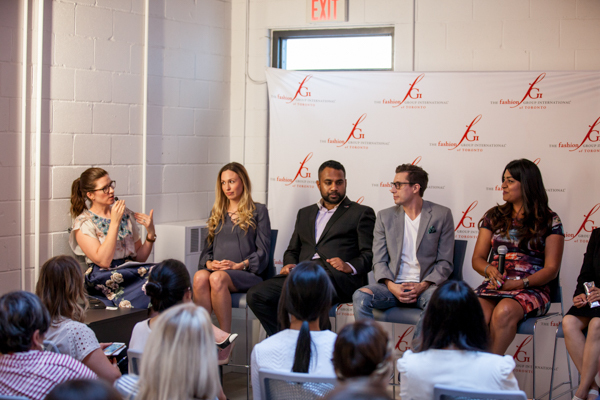 FGI (Fashion Group International)’s latest event, Show Me The Money, brought together a panel of established members of the Canadian Fashion community to share their advice and discuss the ups and downs of creating a fashion brand. Designers, students, and retailers gathered at BrightLane Inc. in Toronto for a networking cocktail hour complete with treats from Pommies Cider, Flow Water, and Oats & Ivy, followed by an informative panel and Q&A. The panel was comprised of Ruby Bhasin, Account Manager, Business Development Bank of Canada, Sal Rabbani, Senior Partner, Consulting, Business Development Bank of Canada, Ashlee Froese, Fashion Brandling Lawyer at Fogler, Rubinoff LLP and Sandy Silva, Chief Merchant & Shareholder, Rent frock Repeat. Speaking as the exerts from a design standpoint, Bojana Sentaler, Designer & Creative Director of luxury outerwear brand Sentaler and Mario Christian Lavorato, Co-founder & Designer of Daniel Christian Tang 3D Fine Jewelry. Moderating the evening was Donna Bishop, founder of Green Beauty. For many aspiring designers and business owners the idea is there, but the capital isn’t. There are generally three different sources of available financing for a fashion start-up. These are equity, debt, and other income such as crowd funding. Equity investors invest money in your business. When you take on an investment from them, they become part owners of your business, which means you will have to share some decision-making with that investor. Debt financing usually comes in the form of loans. One point of discussion on the topic of financing was convertible debt. Convertible debt is when a company borrows money from an investor/a group of investors and the intention of both the company and the investor(s) is to convert the debt to equity at some later date. While many designers choose to seek out investors, others such as Bojana Sentaler are able to personally finance their own companies. “Try to keep everything in house before you give up equity” she advises. However she cautions that financing your own company involves risking it all if anything goes wrong, “if you fail, it’s on you”. Sal Rabbani stressed the importance of planning, including budgeting and marketing and advised: “working with a lawyer only helps protect yourself.” Echoing this Sandy Silva explained the importance of a shareholders’ agreement. A shareholders’ agreement is a contract structuring the relationship between the shareholders of a corporation. For any corporation, it is an invaluable resource, as it provides the foundation for how the owners of the corporation interact with each other and with the directors of the company. Silva invested in Rent frock Repeat because she believed in the company and saw that she would fill a void in the business as she came from a buying background. She spoke of the importance of working with people that you’re going to want to still work with on the worst of days. “People invest in people, not in businesses,” echoed Donna Bishop. Filling a void, or finding your niche, was one common topic that kept coming up amongst the panel. Just as Silva found a void she could fill at RentFrockRepeat, Sentaler strongly suggests finding a “niche” item if you want to make it. She saw a gap in the market and launched a small collection of 7 coats “every woman needs” with feminine silhouettes made from luxurious and functional fabric to keep costs down. “Have the sample, place the order, get the money and put it back into the business”. For Mario Christian Lavorato of Daniel Christian Tang, a foray into fashion may seem an unlikely career path. However, alongside his brother Luca Daniel Lavorato, and Heng Tang, the trio recognized a niche in luxury jewelry, and with backgrounds in engineering and architecture, they found an inventive way to translate their high-tech skills into wearable creations. He shared with the audience how he got his start by refusing to take no for an answer when approaching The Shopping Channel with his pieces. Lavorato explained how selling direct to the consumer when starting off is a good way to understand your customer and highly recommends using Facebook ads for your business.